Just when you thought you'd mastered the swipe left and the swipe right, Tinder throws a curve ball into your love life: a swipe up. 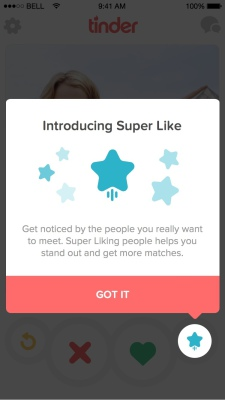 Meet the 'Super Like,' a brand new feature that takes the grand romantic gesture into digital territory. By swiping upwards on a potential date instead of left or right, you can show them that you're interested – like, super interested – before they decide which way to swipe on your profile. After Super Liking someone, a blue banner declaring “So-and-so super liked you!" will appear underneath your name and age in their list of matches. If the attraction is mutual, the super-swiper will have a blue star next to their name in your list of matches. Super Liking is not something to take lightly. Each user gets a limited number of Super Likes per day – only one – so use them wisely. Tech analysts have dug deeper into the intention behind the new feature. Many believe the Super Like was introduced because Tinder has deviated from its original purpose. Instead of using the app to find real dates, many are using it only to kill time. Super Like may help restore Tinder's lost value. Tinder has celebrated the arrival of the Super Like with a cinematic superhero-themed advertisement featuring models Erin Heatherton and Nina Agdal (see below). The feature will launch first in Australia and is slated to roll out globally later this year. Alongside the Super Like, Rad has also stated that the Tinder Plus version will launch soon. The new version limits the number of right swipes a user can make in a 24-hour period, and introduces Undo and Passport options. These advanced settings will be available for a monthly fee. For more on this dating app your can read our review of Tinder.